My first thought is that somewhere something’s spiraling wildly out of control — logical, given a paper clip’s main function: to corral papers. A few steps later and I self-correct. That homeless clip could also mean that somewhere something’s finally getting the chance to bloom and transform. I guess it really does depend on your perspective. It makes me wonder what kind of roles I assign to my paper clips, or if I even HAVE paper clips I carry around in life. I’m partial to clip-free living, but there’s value in both. What about you? 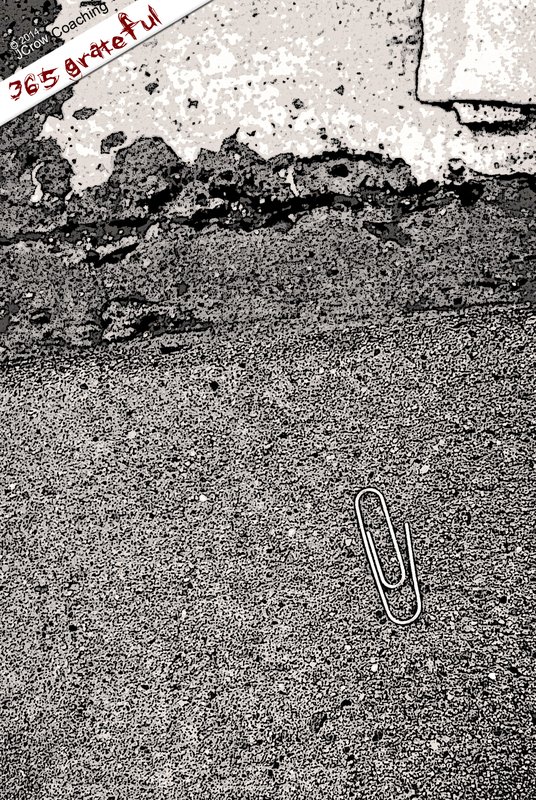 Grateful for a rainy day that caused my eyes to watch the ground as I walked, which allowed me to spy a sad little paper clip on the curb, which was such an odd place that it flirted with my awareness, which caused me to ruminate on paper clip roles, which gave me a fresh perspective on life and the living of it.